Voters in small-town Hailey, Idaho, Tuesday approved three out four marijuana initiatives placed on the ballot over the objections of town officials. Initiatives to legalize the medical use of marijuana, make marijuana the lowest law enforcement priority, and legalize industrial hemp all passed. A fourth measure, which would have mandated the city to tax and regulate marijuana sales, failed. Some 1,288 eligible voters went to the polls in Hailey, with medical marijuana gaining the most votes (687), followed by hemp (683) and lowest priority (637). Taxation and regulation lost by a margin of 573-674. The initiatives were the brainchild of Ryan Davidson, chairman of the Idaho Liberty Lobby, who three years ago began efforts to put marijuana on the ballot in the Wood River Valley towns of Hailey, Sun Valley, and Ketchum. Local authorities in all three communities denied his petitions, and a series of court battles ensued, out of which Davidson emerged victorious. Davidson is working on initiatives for Sun Valley and Ketchum. The initiatives require the city of Hailey to create a Community Oversight Committee to oversee implementation. They also require the city of Hailey to lobby other branches of government for reform of the marijuana laws. State and local officials are likely not happy. The Idaho Attorney General's Office issued a statement last week reminding voters that marijuana possession is a crime under both state and federal law, and Hailey City Attorney Ned Williamson predicted before the vote that the city could be the subject of expensive litigation at taxpayer expense if voters approved the measures. But now the voters have spoken, and it is up to city officials to heed their will. The Denver city council agreed August 27 to put an initiative to make adult marijuana possession offenses the lowest law enforcement priority on this fall's municipal ballot. It's not that the council likes the idea; in Denver, the council must either send initiatives that have gathered the required number of voter signatures to the voters or approve them and put them into law immediately. Unlike a number of other cities across the country that have lowest law enforcement priority marijuana ordinances, marijuana is actually legal under Denver's municipal code. Voters there voted to legalize it in 2005, but local law enforcement and political officials have refused to implement the will of the voters, instead arresting marijuana offenders under Colorado state law. Despite the clear signal from the voters, marijuana arrests actually increased last year. Although the council unanimously approved putting the initiative before the voters, various members lambasted it as mainly symbolic and its supporters for making "a joke" out of elections. "You're trying to make a joke out of the electoral process in Denver," said Councilwoman Carol Boigan. "I think this is aimed at street theater and capturing media attention." Even members who support drug policy reform, like Councilman Chris Nevitt, who supported the 2005 legalization initiative and the failed 2006 state legalization initiative, said the lowest priority initiative was the wrong way to go. "The war on drugs is as misguided as the war on Iraq," said Nevitt, who compared the country's drug laws to the failure of Prohibition. "This issue needs to be taken to the state and federal level. Denver voters have already spoken." The initiative is the brainchild of Citizens for a Safer Denver, the latest incarnation of executive director Mason Tvert's SAFER (Safer Alternatives for Enjoyable Recreation), which started off winning campus votes to equalize penalties for marijuana and alcohol, then moved on to the stunning legalization victory in Denver two years ago. SAFER's primary point, which it hammers at continuously, is that marijuana is safer than alcohol. Tvert and his fellow activists have specialized in tormenting the Denver political establishment for its stand on marijuana, particularly targeting Mayor John Hickenlooper, who owns the Wynkoop microbrewery and who opposed the legalization initiative, the failed statewide legalization initiative (which won majority support in Denver), and the pending initiative. They once followed Hickenlooper around with a man wearing a chicken suit named "Chickenlooper" when he refused to debate them. SAFER and its latest municipal incarnation have also specialized in innovative tactics designed to incite media attention to advance their cause. And they've been at it again in recent weeks. 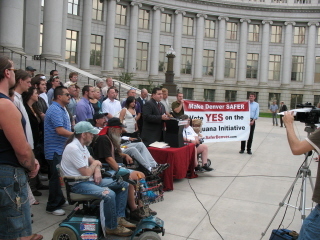 In an August 23 press release the group offered to withdraw its initiative if the city council and mayor would agree to enact a moratorium on marijuana arrests during next summer's Democratic national convention, agree to formally recognize that adult marijuana use is less harmful than alcohol use, and agree to explore marijuana policies that reflect the understanding that marijuana is less harmful than alcohol. 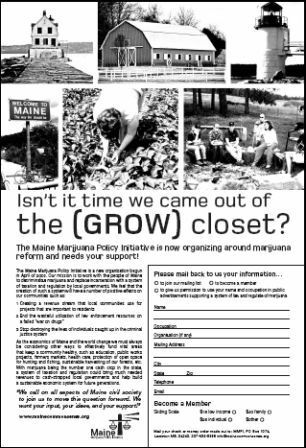 "In order to demonstrate their commitment to a more rational approach to the use of marijuana and alcohol -- and to set an example for the rest of the nation -- our campaign respectfully requests city officials enact a moratorium on citations for adult marijuana use during the 2008 Democratic National Convention," said Tvert in the press release. "Tens of thousands of people will be flooding Denver for this tumultuous event, and visitors and city residents should not face the threat of arrest for simply making the rational, safer choice to use marijuana instead of alcohol, if that is what they prefer. After all, this is the first city in the United States that has voted to remove all penalties for private adult marijuana use," he noted. "We understand the Denver City Council and Mayor Hickenlooper are extremely concerned about maintaining order during the convention. By allowing adults to consume marijuana instead of alcohol during this hectic time, they could potentially prevent the disorder that all too often accompanies the use and abuse of alcohol." "The council was looking for ways to keep our initiative off the ballot, so we decided to help them out," Tvert told the Chronicle this week. "We also wanted to generate some attention as the spotlight is put on Denver for the Democratic national convention." The council and mayor unsurprisingly didn't bite, but the offer received saturation press in Denver and Colorado, and even managed to earn a story in the Washington Times, "Pot Touted to Calm Denver Rallies." "The council basically pulled a 180 trying to fight to keep it on the ballot in the face of our offer," Tvert said. "We weren't allowed to withdraw the initiative, but this just shows they're trying to void this any way possible." Tvert also had some less than kind words for the mayor and the council. "The council has signaled they will oppose the initiative," he said. "There are three who say they are with us in spirit but against this particular law. Our city council has every right to tell the police to stop arresting adults for marijuana possession, but these people are acting like cowardly sell-outs," he said, singling out council members Chris Nevitt and Doug Linkhart, both of whom support marijuana legalization. Neither Nevitt nor the mayor's office returned Chronicle calls seeking comment, but Linkhart did. "I would like to see marijuana legalized in Colorado," said Linkhart. "Voters here in Denver have twice voted for that, and I supported those efforts. But I don't support this initiative. The police are sworn to enforce the law, and you either have the law or you don't," he said. Linkhart also attacked Tvert over his tactics. "His stunts make some elected people angry, and that may hurt his cause," he said. "He is good at getting a lot of attention and getting the media involved, but I'm not sure that really helps his cause." "They say this measure is only symbolic, but it will create a law that they will have to break if they want to continue doing business as usual," Tvert said. "We're forcing their hand on this." Tvert and Citizens for a Safer Denver also managed to generate a story in the Denver Daily News the day of the council vote that outed at least four council members and the mayor as having smoked marijuana. Titled "Hypocrisy on Pot?," the piece could not have been more timely. "We knew the mayor had partaken," said Tvert. "He says he had admitted it, but it was news to most people. This just shows how full of crap they are. We had a couple of council members saying marijuana is a gateway drug, but those council members who smoked, as well as the mayor, all seem to be functioning well," he snorted. And while the fall vote is still weeks away, Tvert and the crew are keeping up the pressure on the mayor and the council. Their latest move is to demand a public hearing on a measure that would renew the city's partnership with the Coors Brewing Company, based in suburban Golden. The deal would allow Coors to sponsor events at the Colorado Convention Center, among other venues. The deal "sends the wrong message to children," said Tvert. "Once and for all, the Council needs to explain why it is necessary to punish adults for using marijuana in order to send the right message to children, yet somehow it's no problem to have our city officially partner with an alcohol company to promote alcohol use to all who attend these events, including children," he said, adding that he is concerned that Coors could be sponsoring a circus next month where many children will be in attendance. Maybe the Denver political establishment would be better off getting on board with its citizens' views on what the marijuana laws should be. At least then, it wouldn't have Tvert to hound it. A California Superior Court judge Tuesday rebuffed an effort by the city of Santa Barbara to undo the city's voter-mandated policy of making the enforcement of the laws against marijuana use the city's lowest law enforcement priority. Voters approved the law, known as Measure P, last November with more than 65% of the vote, but recalcitrant city officials sued local activist Heather Poet, the initiative's proponent of record, in a bid to get the measure overturned. The city argued that the law should be overturned because it interfered with state and federal marijuana law enforcement, but Judge Thomas Anderle disagreed, dismissing the case. "Nothing in [Measure P] prohibits enforcement of state law... Police officers can still arrest those who violate drug possession laws in their presence. The voters have simply instructed them that they have higher priority work to do," he said in his ruling. "Santa Barbara is free to decline to enforce federal criminal statutes," he added. "Indeed, the Tenth Amendment to the United States Constitution prohibits the federal government from impressing 'into its service - and at no cost to itself - the police officers of the 50 states.'" Judge Anderle also cited California's ban on SLAPP suits, or strategic lawsuits against public participation, which bars officials from suing individuals for their political activities. Although the city claimed in court filings that it sued Poet only because it needed someone to sue to challenge the law, Anderle found that the lawsuit arose from "her constitutional right to participate in the process of formulating laws" and thus violated the SLAPP suit law. "Today's ruling is a major victory for the democratic process and a resounding affirmation of voters' right to de-prioritize marijuana enforcement," said Adam Wolf, an attorney with the ACLU Drug Law Reform Project, which represented Poet in the proceedings and which filed the successful motion to dismiss. "The people of Santa Barbara would rather local law enforcement focus on combating serious crime than policing marijuana use. Today's ruling confirms that the voters can make this fundamentally local decision about their community's safety." "It was terrifying to be sued by my own government, and for a fleeting moment it made me feel maybe I shouldn't have gotten involved in the democratic process," said Poet. "But this decision proves we do have a voice and we should never be afraid to use it. It also affirms that people in Santa Barbara, and throughout America, can protect their communities by having police focus on serious crime, rather than marijuana offenses." Measure P makes "investigations, citations, arrests, property seizures, and prosecutions for adult marijuana offenses, where the marijuana was intended for adult personal use, the city of Santa Barbara's lowest law enforcement priority." At least six other California jurisdictions have enacted lowest law enforcement priority initiatives as part of a broader effort to end marijuana prohibition in the state. Maine is set to become the latest state to try passing local initiatives to make adult marijuana use the lowest law enforcement priority. A state group with affiliations with the Marijuana Policy Project, the Maine Marijuana Policy Initiative (MMPI), has submitted petitions to officials in five western Maine towns, and is already set to go to the polls in Sumner. Town meetings in Farmington, Paris, West Paris and Athens, where petitions have been delivered to local officials, may also consider the initiatives next year. Maine activists are starting small, but thinking big, MMPI executive director Jonathan Leavitt told the Associated Press. "The purpose of the ordinance is to let the county, state and federal government know that many people believe the marijuana laws are not working," Leavitt said. Lowest priority initiatives have proven extremely successful since first pioneered in Seattle in 2003. Cities that have passed such initiatives now include Oakland, Santa Barbara, Santa Cruz, and Santa Monica, California; as well as Columbia, Missouri; Eureka Springs, Arkansas; and Missoula, Montana. But Farmington, Maine, Police Chief Richard Caton didn't think much of the idea. Who knows what kind of people might be attracted to town, he warned the AP. Also, the chief said, police would be caught between local and state and federal law. "A better way, if this is the sentiment of the people, is to change the state and federal laws," he said. The Maine lowest priority ordinances would prohibit communities from accepting federal funds that would be used to enforce the marijuana laws and would require police to submit reports on the number and type of marijuana arrests to each municipality that adopts the ordinance, he said. Municipal officials would be required to notify state and federal officials they want to see marijuana taxed and regulated, not prohibited. Lt. Hart Daley of the Oxford County Sheriff's Department didn't like the sound of that. "We still consider drug offenses on the top of the list of our priorities," Daley said. Attitudes like Daley's are why local initiatives are only the beginning.